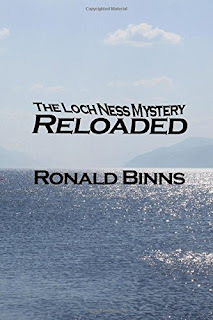 In the first chapter of his new book, Binns continues his retrospective on his previous book, "The Loch Ness Mystery Solved", by revisiting some old classic cases. The first is Aldie Mackay's report from 1933, generally regarded as the first sighting of the modern Nessie era. Binns rehashes some of the arguments he levelled against the Mackays in his 1983 book, finally concluding this witness had just seen a boat wake. Binns in both books does not answer the objection of how a long time resident who was an angler and familiar with the moods of the loch surface could be taken in by such a simple deception. Despite Binns admitting he reads my blog, he makes no mention of my 2013 article on the Mackay sighting which takes him to task for errors in his analysis. This was a perfect opportunity for Binns to show how weak my arguments are, but no answer came. I could make some argument from silence, but I refrain as I will point out for effect later on in this article. However, Binns adds nothing new of substance to his previous book on this matter. The Spicer case is equally dismissed on questionable grounds such as the fact that the witnesses were driving a car. Now why this should cast doubt upon the case is unclear, especially since they were driving towards the creature, not to the side and not away from it. What is worse is that, like the Mackays, the nebulous tool of "expectant attention", which can magic away many an inconvenient eyewitness testimony, is employed as Binns tries to convince us that George Spicer knew all about the monster beforehand and this therefore prejudiced his judgement. The theory of "expectant attention" is the idea that an observer's assessment of an observation such as bow waves, otters, etc is compromised by an expectation that the Loch Ness Monster needs to be included in the list of candidates. It is a theory that no one disputes has merit. What is under dispute is the application of it. In what circumstances should it be used? How can its use be judged when nothing is known about the witnesses' psychological state? How is it to be used, if at all, when we have a witness that has experience of the loch's various facades? I do not recall any article by any Loch Ness sceptic on application guidelines. Rather, it appears to me that the theory of "expectant attention" is applied in a lazy and indiscriminate manner without any regard to the situation it is being applied to. I put it to the readers that this is the case here. Now I covered Binns' objections to the accuracy of the Spicers' account in a previous article, but since it was published after Binns' book, I do not expect to see a response in said book (if ever). Binns does add a new complaint concerning changes to the original Spicer-Gould sketch in the books of Whyte, Dinsdale and Holiday. I had already pointed out this issue in my aforementioned Spicer article and took Whyte to task for it, but it clearly has no impact on the original sketch and account which should be taken as the primary source. As for Dinsdale and Holiday, apart from Dinsdale relocating Spicer's "flap" to be a tail tip, this matter looks very much to be in the eye of the beholder - be they sceptic or believer. To me it just looks like hand copying errors, to Binns it is one of his overstated "important" things. Binns further takes Holiday and Dinsdale to task with the suggestion that they had a dodgy agenda missing things out in the Spicer case which again look wholly insubstantial to me. Yet how ironic that Binns decides to omit the subplot of William McCulloch who was a corroborating witness to the area of flattened undergrowth which "was as if a steamroller had been through". Dodgy agenda? Surely not. For some reason, Binns changed his mind on George Spicer. He initially put him down as taken in by an otter but now he is fooled by some deer. The deer "huddle" argument is covered in my aforementioned article. Indeed, Binns was mainly covering old ground here. I could get most of this stuff from his 1983 book, so what was the point in these chapters? Now moving on, Ronald Binns devotes a chapter to Rupert T. Gould and, not surprisingly, the critique is designed to cast doubt upon the subject's integrity and ability. Binns makes certain accusations against Gould that are questionable. This latest book has given me renewed opportunity to analyse this form of argumentation and I would liken it to the traditional game of Jenga. As you may know, Jenga is a game based upon a tower constructed from wooden blocks. 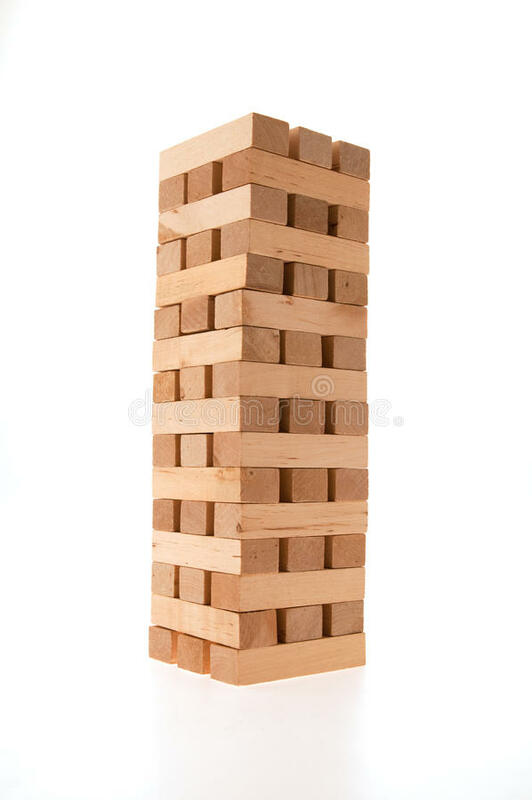 Blocks are successively removed by players until the tower collapses. 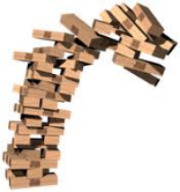 I would suggest the Binns argument against Gould is a Jenga tower doomed to topple. In fact, the Binns tower appears to be one constructed from easily challenged sub-arguments, the successive removal of each causes eventual collapse. The tower may look impressive in sum total, but the overall structure is not sound at the individual level. Let us look at each block in turn as they are then pulled from the tower. In so far as I had any theory on the subject, I considered that the witnesses had probably seen, but failed to recognise, some well-known creature which, in some unexplained manner, had made its way into Loch Ness. However, Binns does not accept this statement from Gould on the grounds that he had previously written a book in 1930 entitled "The Case for the Sea Serpent" which advocated the cryptozoological existence of sea serpents. Binns portrays Gould as a prejudiced researcher loaded with confirmation bias. But where is the proof for such an accusation? There is none provided and the grounds for such an attack is merely based upon a line of reasoning that says, "Gould believed in sea serpents", "People were reporting sea serpent like creatures from Loch Ness", therefore Gould would have believed them to be sea serpent reports. This makes no sense at all as a deduction and looks more like biased speculation. When I thought about this from my own point of view as a believer in aquatic cryptids, I certainly do not jump on the next monster bandwagon whenever I hear about some report from a lake in some other country. Neither do I presume there must be a large, unidentified animal in a body of water just because a distant blob is snapped from someone's mobile phone camera. Indeed, examining Gould's 1930 book, one is left wondering whether Binns had actually looked at it. I have a copy and so reviewed it in the light of Binns' accusation and what I found was a Gould who didn't swallow every sea serpent report that came his way. In his introduction, Gould admits that "there were practical jokers who took a delight in hoaxing the public with stories of sea serpents". As to the matter of misidentifications, Gould refers to the previous work of Oudemans entitled "The Great Sea Serpent" and its 187 sea serpent cases. From these, Gould dismisses "at least half" on the grounds of insufficient evidence or more natural explanations. So much for the version of Gould that is desperate to see monsters everywhere. Of course, if anyone chooses to assert that I went to Loch Ness with the intention (conscious or subconscious) of identifying the "monster" as a "sea-serpent," and points for confirmation to the fact that I have already committed a book about such creatures, and am an avowed believer in their existence, I have no means of disproving his assertion. But if I am any judge of what I think, and of how I form my convictions, I can - and I do - contradict it most emphatically. I retained my original theory - that some known creature had found its way into the Loch - so long as it appeared to fit the facts; I only discarded it under the compulsion of what I consider to be reliable and convincing evidence. It is to be noted that Binns decided not to quote this passage in his book. Binns move on from his whataboutery tactics by further accusing Gould of not consulting any sceptics at Loch Ness. This employs the decidedly weak approach of argumentum ex silentio since Gould does not explicitly state this to be the case. Indeed, Binns tries to wrestle Gould's words to imply he was out only to speak to believers. This is said to be the case when Gould stopped off in Edinburgh to confer with Scotsman journalist, P. G. Stalker. Binns employs hyperbole by describing Stalker as "an ardent promulgator of the monster" and "second only to that of Alex Campbell". However, Binns cannot even get his basic facts right here as it was not Stalker, but his boss, J. W. Herries, who directed reporting of events at Loch Ness. Herries told Stalker to break off from reporting on Navy manoeuvres on the Moray Firth to find out what was going on at Loch Ness. Consulting my copy of Herries' autobiography, "I Came, I Saw"; he makes this clear enough and admits it was a bit of a risk putting such articles into the normally sober minded newspaper. However, the reaction of readers proved it to be the right decision and The Scotsman began a long association with the Monster of Loch Ness. 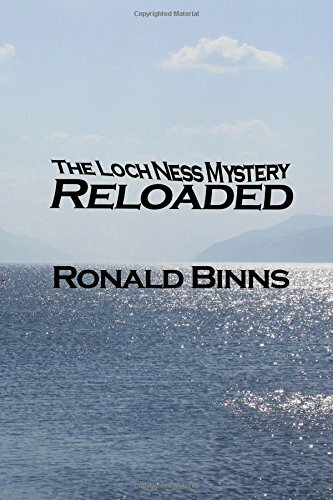 It is no surprise that Ronald Binns is not pleased with this "promulgation", after all, he does not believe there is anything unusual in Loch Ness. To deride the Scotsman newspaper for printing these eyewitness accounts says more about the derider than the derided. Of course, Gould did not go to Edinburgh to be indoctrinated by "ardent promulgators". His chief mission was to examine the various articles to extract eyewitness information for his own research purposes later on at the loch. At that time, only Scottish newspapers were reporting with any consistency and detail on events at Loch Ness. Therefore, it is no surprise that Gould made his way to Edinburgh. Did Gould only consort with "believers"? Well, Gould's book says he consulted with Mr. E. W. Porter, resident engineer of the Caledonian Canal on the waterways between Loch Ness and the sea. That doesn't sound like an exercise in confirmation bias. I guess that disproves Binns' accusation and it is clear from Gould's book that he quotes and examines the opinions of well known sceptics such as the zoologists Calman and Boulenger. But Binns demands to known why Gould did not visit Captain John MacDonald. John MacDonald is one of the poster boys of Loch Ness Scepticism. Back in the early days of 1933, MacDonald wrote to the Inverness Courier as captain of one of the loch's steamers saying he had not seen anything unusual in his decades of navigating the loch. Binns rolled this man out in his 1983 book and does so again here. If so many reputable people say they have seen 'the beast' one inclines to the belief that there is something in it. MacDonald says his daughter, Christina, saw the monster and I take her to be the Miss C. MacDonald who saw the creature in its single hump aspect on 22nd October 1933, and whom Gould interviewed for his book. Perhaps Gould met the captain while he interviewed his daughter? If so, I suspect John MacDonald was less than sceptical. So what other local sceptics should Mr. Gould have consulted? Perhaps Mr. Binns can name some more for us. "Were I rewriting the book, I should have omitted this case. I think the Spicers saw a huddle of deer crossing the road. RTG". Now Gould concluded his research for his book in the first half of 1934. I had contacted Jonathan Betts to get the original annotations of Gould's book and it turned out his Spicer recantation happened no later than November 1941, or about seven and a half years after his book. I suppose I must go out on a limb here and ask how changing ones mind on a single case seven years later calls into question ones entire methodology? After all, Ronald Binns changed his mind on the same case when he went from an otter to a deer explanation. Does that call into question his investigative techniques? The answer is "no"; well, in this instance anyway. Gould does not explain why he changed his mind but one may presume he came across information he regarded as new data which was fed back into his assessment of the case. For Gould, it seems the data changed and not the method of investigation. Binns then descends into more whataboutery by taking Gould to task for not contacting Hugh Gray or Kenneth Wilson about their headline grabbing photographs. It is not enough that Gould discusses the photographs in his book, but he must also show proof of interviewing them. The lack thereof is taken by Binns to again prove that Gould was not a thorough investigator. This is another instance of Binns devising ways in which Gould should have gone about things and since he didn't, it is an easy win for Binns. But the correct deduction from the source material is not "Gould did not contact Wilson or Gray" but rather "We do not know if Gould contacted Wilson or Gray". However, by setting up his straw man statement, Binns can proceed to fill the fact free void with less than neutral speculations for another Jenga block. In the case of Kenneth Wilson, my counter balancing speculation is based a bit more on the facts. Wilson's role in faking the Surgeon's Photo was documented by Boyd and Martin in 1994. What comes across in their investigation was a picture of a man who was very reticent to talk about the picture and indeed give oblique hints that all was not what it appeared. In that light, it seems more unlikely than likely that Wilson would have granted Gould an interview (if anyone is aware of Wilson granting interviews to the media, let me know). In the case of Hugh Gray, the two men were separated by over 500 miles. I have no idea if Gray had his own phone line and I am sure Gould would not have undertaken a special journey just to see him (note Gray's photo had not been published at the time of Gould's loch visit). If Gray was amenable to written correspondence, we will never know as such a thing is not stated either way. I would add that Gould comes across as not too enthusiastic about Gray's photo and employs words such as "vagueness" and "indefinite" to it. Having said that, he does accept it as a photograph of the creature. One also has to add that as a sea serpent investigator, Gould would have had next to no experience in critiquing such photographs. Indeed, I find no reference to such pictures in "The Case for the Sea Serpent" as such an item is even more rare than any of the Loch Ness Monster. I must plead guilty to having taken a copy of the book North with me, and I must also confess that I occasionally showed it to a witness - but I made it my rule not to do so until after I had taken the statement, and to attach no weight to suggested modifications of this which I considered the book might possibly have inspired. I used its illustrations as a means by which witnesses who could not draw might be able to indicate something to me which more or less resembled what they described; and I consider that this was a very natural proceeding. If, for example, I were an insurance official, going to interview a witness who had seen a car accident, but could not tell the make of the car, I should certainly take an illustrated catalogue of cars with me. And if for some reason (or prejudice), no such catalogue were available, I should certainly do my best to compile one of my own. The Binns hyperbole machine goes into action as phrases such as "extraordinary admission" and "blatantly manipulative" are wheeled out to increase the impact of the argument. As the old preacher's notes used to say - "argument weak here, thump pulpit". Note that Binns does not include the first Gould paragraph above which lessens the alleged impact of the second paragraph. In the hierarchy of persuasive arguments, there are empirical facts, deductions and finally speculations. What Binns has done to Rupert Gould lies at the far end of the "speculation" spectrum. The fact that Binns employs some ready made binnsisms* to dress them up in the language of empiricism should not fool anyone. Since I undertook to review this book, I have found so many errors, exaggerations and weak logic it would be a herculean task to enumerate and dismiss all of them. But I have better things to do with my time, such as finishing off my own new book. So, I will do one more review and that is Binns' critique of my own previous work, "The Water Horses of Loch Ness". In the meantime, take it from this and the previous article that this is a book that continues the ignoble tradition of "slasher" scepticism. * Binnsism (n.) A psychological tactic derived from politics in which the weakness of an argument is obscured by the use of hyperbolic language. Still Fancy a Move to Loch Ness? On the back of my recent article about retiring to Loch Ness, a reader emailed to inform me that his house was up for sale in Drumnadrochit. You can get all the details here. Of course, you may ask, having spoke of the attractions of living by Loch Ness, why this person is leaving. He has told me in his own words with a summary of his time at the town and loch. AFTER TEN years of living the dream, we have decided to leave our Loch Ness-side village and return to our south England roots. Why? Because every single one of our family lives down there, and we don’t want our young daughters growing up without knowing them. And we miss them ourselves. Drumnadrochit, some 14 miles south of Inverness, is the traditional centre of all things Nessie. It hosts the two major exhibitions – the Loch Ness Centre and Exhibition, and Nessieland – and boasts gift shops and places to eat. But it is much more than a tourist centre. There is a Primary School and a High School (both well-regarded), a childcare centre, an after-school club, a community centre where senior citizens get together and enjoy good food, a library… essentially, everything a good village should have, and more. Some people have sincerely-held doubts about living here. Well, speaking from a decade of experience, I can only say that we have led an enjoyable, trouble-free life here, and would probably continue to do if our family had joined us. Tourists? Not a problem. Yes, they visit Drumnadrochit during the summer, but it never results in Oxford Street-like crowding, and their presence here is always welcomed. Road conditions? I have yet to fall foul of wintry roads, and the gritters and ploughs do a fine job. Snow? Yes, we sometimes get a fall of the white stuff, but it is part of the allure of the Highlands – when the snow settles, there is no more beautiful sight in the world. We were awestruck when snow fell one Christmas Eve; gorgeous and uplifting. And when the snow does come, children and adults alike can be seen sledging on one of the many hillsides which are perfect for it. Drumnadrochit is a small, friendly village. Many residents have lived here all their lives; others have moved away, only to return because they missed it so much; and those of us who arrive from England are made to feel part of what is a close-knit community. Indeed, there are many examples of people from England following their families to Drumnadrochit… and staying. Then, of course, there is Loch Ness. You can see it from the top of our road. As can the sheep who inhabit the field. When conditions allow, you can walk to the shore and gaze in rapture at the breathtaking view of the Loch. It really is a magical feeling. And you hop in your car and take a short drive, there is any number of vantage points from which to admire the water. Urquhart Castle is close to us. I wonder how many people have – as I did – stood in the very spot where the Surgeon’s Photo was taken and felt that delicious sense of history. I cannot count the number of times I have looked out upon Loch Ness and witnesses tantalising ripples in the water, wakes with no obvious origin, and distant shapes that have made me wonder… what if? There is no feeling of isolation here. Buses stop at various points in the village (my partner has made numerous friends while travelling back and forwards to Inverness). And the nearby A82 provides an excellent link to the rest of the region. Among our neighbours is Adrian Shine. A great man: charming and friendly. As is Nessie-Spotter Steve Feltham, who lives at Dores on the other side of the Loch. He recognises us now and always has time for a chat. We will miss all of the above, for sure. A lot. But we also miss our family, and the time has come to return home and be among them again. We will certainly miss our bungalow. It’s detached, with a self-contained annex. This leaves scope for renting and/or holiday letting. There is serious money to be made for those who fancy it. You could live in the main bungalow and let out the annex; or vice-versa, as the previous residents did. Or just take over the entire building and wallow in the living space. Our Loch Ness adventure is approaching its end; a new one lies on the horizon. For anyone wanting to live the same dream, you could do no better than move here. It really is fantastic.